Vending Machine Theft is a series of datapads and visual clues leading the player to Bennyhenge. It functions as an untracked mission. The trail begins on Port Olisar, where the player may find two datapads. 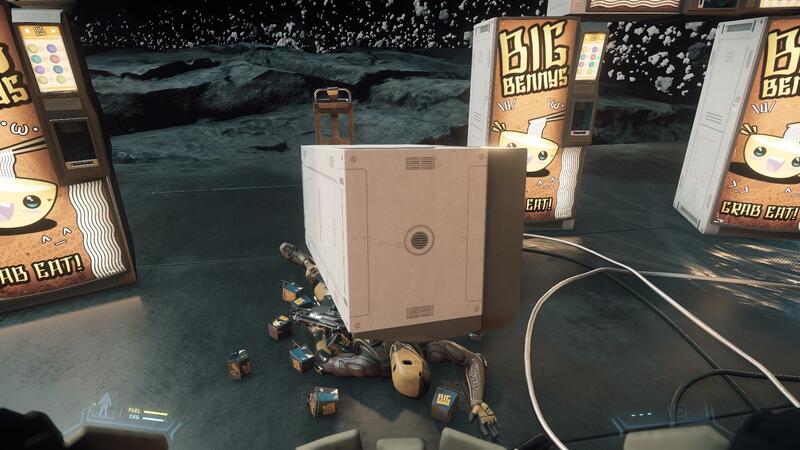 On 2945-03-03 we received our first report of missing BIG BENNY brand vending machines from the Port Olisar commuter hub station. Alby Mollion, the on call manager, explained that a TERRA MILLS SERVICE TECHNICIAN had come to repair the machine and informed him that it would have to be taken to an offsite center. The following week, shift supervisor Tony Losong contacted Terra Mills Service Center to inquire about the repair only to learn that the so-called service technician had not in fact been associated with the company. It was at this point that Crusader Security was contacted by the Port Olisar administrators to look into the matter. Security vids pulled from the station’s feed captured the suspect leaving with the machine in question but so far, facial match has been a dead end. It is surmised that the suspect was wearing spoofs, faux-vis, or some combination thereof. Attempts to track the suspect’s transport also proved futile as the regtags were traced back to a decommissioned hauler. On 2945-03-05, we received a second report from CryAstro station 1267SC where their Big Benny unit was also taken under the guise of repair. Not long after, dozens of similar reports from other stations around the Crusader sector began to trickle in, stating that a false Terra Mills technician had removed their Big Benny machines. Those separate reports were vetted and indexed under this main casefile once the connection was confirmed. In the meanwhile, we have been working with Terra Mills to issue a general warning to all Big Benny machine owners to be on the lookout for unscheduled service technicians and that they should always demand to see credentials. An image of the suspect has likewise been circulated. However, since 2945-03-12 there have been no further reports. In attempt to track down the culprit we have notified scrap yards and secondhand sellers to alert us if someone tries to offer a Big Benny unit for sale. We have also tasked Terra Mills with tracing unusual refill orders surmising that the stolen machines may eventually require more Kacho to be stocked..
EDIT 2945-03-21 ** We did have a possible hit on the VSS we put out on the suspect’s transport, but reached a dead end after we lost the trail near Grim HEX. We currently don’t have the resources to investigate directly, but I have put in a request for a CI to follow up. What better way to explore the grand expanses of the Crusader than by riding aboard a Genesis Starliner that was built planetside by Crusader Industries. These luxurious cruise ships offer tours of not only the gorgeous upper atmosphere of Crusader proper, but offer a myriad of options and destinations. Why not start with a sunset tour to see a Genesis being built right before your eyes in the beautiful latticework of Crusader Industries; expansive shipyards? From there you can cruise along to the lower atmosphere to experience the colorful cacophony of one of our famous “light storms” or head out into orbit to visit the beautiful icy moon of Yela. Named for the oldest sibling in the childhood favorite fairy tale “A Gift for Baba,” a visit to this frozen landscape will surely have all the makings of a tale of your own. For more information on tickets and timetables, or to learn more about places to see and visit during your stay, please contact the Crusader Visitor Information Center. The first datapad leads your investigation to GrimHEX, while the second serves as useful information for later on. At the back of GrimHEX Bar you will find a third datapad, evidently written by the thief. Remember, this is a free flowing expression of your thoughts. Don’t hold back. Don’t edit. Be true and you will find truth. Impact over substance or transformation over rehabilitation? The medium is part of discussion as much as the discussion itself is a medium of the art, but when that message overcomes the piece, is that the ultimate goal? Should the work stand or topple? Stop to ask ‘what if’ but make sure the remaining question is always why. Found another critique - “Though the work is an assault on the space, there remains little bite behind the attack. The only kindness in the experience is that the all the leftover resin has been promised to a local art school. Hopefully it may find use as art yet.” This is what I need. This pain. While I had some concerns at first, I am thrilled that my new hab is proving a fruitful ground for inspiration. Leaving the comfortable familiar behind and embracing the chaos of Grim HEX has been so cathartic I have begun to count losing all my credits as a blessing. You see these other artists who “make it.” Denara with his looms lapping up the critic’s praise, or Tamsa and her painted ships. Their embracing of the commercialization of art is the very poison that is destroying our souls. To expose how deep this commoditization of Humanity would be a true work of inspiration. I watched an ambush today outside the base. It was thrilling and terrifying at the same time, but it was the aftermath that struck me the most. The silence after the predators had flown away, stripping the cargo of their prey, I found myself transfixed by the drifting hulk of the wreck. The twisted shapes losing all function and becoming pure form. Definitely a motif to be explored further. I met a woman today who goes by the name Threetoe. She told me that if she was to die she’d want to be floated out in the asteroids by ‘the Big Sister.” She explained how her mother used to read the ‘A Gift for Baba’ to her growing up and she always related to the character. It amazes me the impact these stories of our youth can shape our very being. What replaces them as we grow older? The stories stop, but the need persists. What are the fairy tales that give us comfort now? The answer came to me as my thoughts were interrupted by cries of “So Yum, So Wow” from a nearby Big Benny’s machine. This is how the story of Humanity will be told. This corrupt consumerism will be the monument that we leave behind. The 2nd datapad should inform the player that "The Big Sister" is referring to Yela (named after the oldest of three siblings in a 24th century fable), and that the trail leads to Yela's asteroid belt.